If you know how to make healthy Chinese soup you can reduce times to go to see a doctor as many Chinese soup cures illness. Soup is the soul of food. So an important principle to make soup is that don't always bother it. Especially when you make broth soup. It needs longer time. Add enough water. Just let itself simmer for at least one or two hours. Now you know that cooking soup is actually easier than any other dishes. In view of Chinese medicine, the attribution of food include Qi and flavor. Food Qi includes five energies, that is hot/warm, cold/cool, and neutral. Food flavor refers to sour, sweet, bitter, pungent, salty. When you eat food you are eating its flavor. When you drink soup you are eating its Qi. Soup can treat disease. Chicken soup can prevent and cure cold and flu; Pork Bone soup can prevent and cure skin itch and supplement blood; beef soup can warm the stomach and regulate the spleen; fish soup nourish Yin. 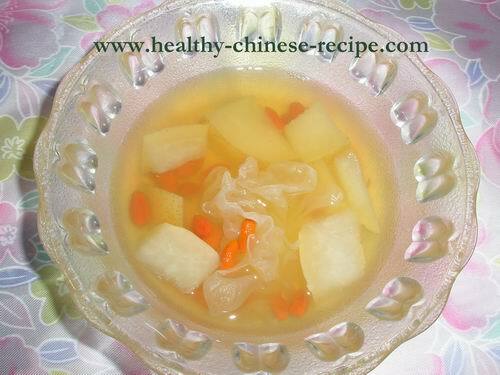 White Fungus with Pear and Lily Bulb soup can relieve cough caused by heat and dry. When treating disease, it's making use of food Qi. So it needs longer time cooking to get its Qi. If your soup is for health purpose, don't add too much seasonings and herbs as most of them have heat energy. They'll disturb the food Qi. The fact is that the most delicious soup (especially meat) is to add nothing. (Remember what Panda's father-the duck said? The best seasoning for his soup is nothing!) Of course, you can add some rice wine, ginger, onion, and radish to remove smell. And add salt for taste. Broth soups can warm up us in cold day. That means excessive intake may cause heat(inflammation) in our body. So we cannot drink meat soup too frequently even if soup is good to our health. Once a week for normal supplement; continuous three days or till recovery for illness treatment. In China it's a tradition to make medicinal soup to treat disease or as a supplement. Many herbs used in medicinal soups are both food and medicinal herbs. However, adding what kind of medicinal herbs depends on your own health condition. You should consult local Chinese doctors. In many restaurants they put many herbs that promote Qi such as Astragalus (黄芪，HuangQi). If you are Yin deficiency or have internal heat, the soup will cause much more heat(inflammation). If you abide by simple and original (flavor) principle, you can make healthy Chinese soup easily.